the canDIshhh tales: Join Knorr Lutong Nanay Food Fair on October 24 at Mercato Centrale! Join Knorr Lutong Nanay Food Fair on October 24 at Mercato Centrale! Knorr partnered with Kabisig ng Kalahi for the Metro Manila leg of the initiative, to build a sustainable nutrition program that goes beyond simply distributing food. With simple, easy to follow, healthy meals, moms also learn to provide their kids with delicious and nutritious dishes. Knorr recently visited two barangays in Smokey Mountain, Barangay 101 and Barangay 128, with its ambassadors. Dimples Romana, Danica Sotto-Pingris and Sari Jorge joined forces to help educate moms and children the importance of a healthy diet for the family. Over a meal of afritada, they also shared their personal experiences, cooking secrets and how they entice their kids to eat a healthy, balanced meal with the help of Knorr. “It was a beautiful experience na makasama ang katulad kong Knorr Lutong Nanay moms together with our children in sending out a message to all the other Filipino moms like us to join in our fight against malnutrition,” said Dimples Romana. Meanwhile, ambassadors Carmina Villaroel and Chesca Kramer joined Knorr at the Cardinal Sin Village. Mothers and children collectively learned the importance of a vigorous diet for the family. The program was a good exchange of insights, experience and learnings not only from the ambassador, but from resident mothers as well. As the theme of sharing experiences and learnings continued, one mother shared, “Ngayon, kaya ko nang magluto ng pagkain na hindi lang masarap, masustansya pa.” Another participant shared how she realized the importance of preparing healthier meals for her family by incorporating vegetables in their meal plan unlike before, where they usually prepare meals with minimal consideration to nutritional value. With the help of Knorr’s Lutong Nanay nutrition program, more and more moms are inspired, motivated and informed about how important it is to serve healthy meals for their family. It’s a long way to go but Knorr’s ongoing program is a big step towards fighting malnutrition in Filipino children. Knorr continues to empower Filipinos to cook flavorful, nutritious and affordable meals everyday. It emphasizes that moms are the pillars to help alleviate malnutrition. 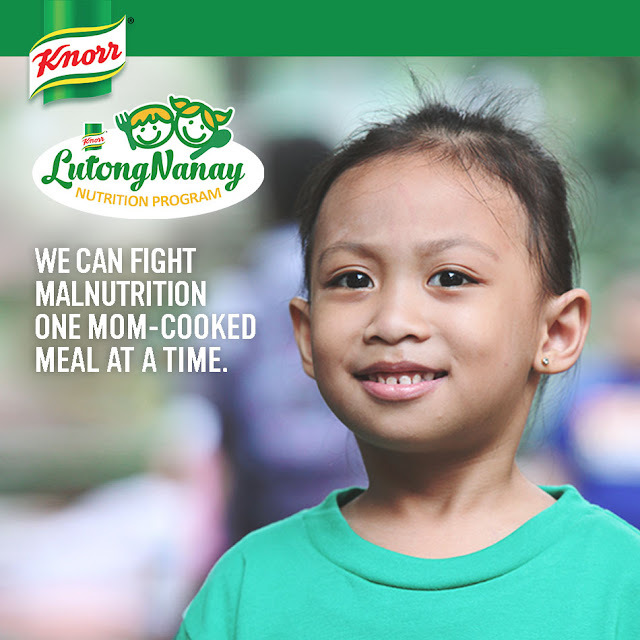 Together, Knorr’s Lutong Nanay dishes and moms can diminish this issue that affects so many Filipinos, one mom-cooked meal at a time. Proceeds will go to the Knorr Lutong Nanay Nutrition Program and its partners, World Food Program and Kabisig.